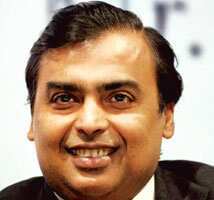 Mumbai: In less than a fortnight, Mukesh Ambani, promoter of Reliance Industries Ltd (RIL), India’s most valuable company in terms of market capitalization, will need to take a formal call on conversion of 120 million preferential warrants into equity shares for Rs16,842 crore. At the time of the allotment of preferential warrants in February 2007, Ambani had paid 10% of the amount, about Rs1,684 crore. The balance—Rs15,158 crore—needs to be paid to convert the warrants into shares. Conversion of these warrants into equity shares of Rs10 face value was fixed at Rs1,402 per share—at a 12% premium to the then average weekly price of RIL stock. The promoter’s holding in RIL, currently pegged at 51.36%, will rise close to 55%, if Ambani exercises his right to convert the warrants into equity shares. A person close to the company, who as usual didn’t want to be named, claimed Ambani would go for the conversion and write a cheque for the equity shares. “It (the arrangement) has been made," this person said. A spokesperson for RIL declined to comment. Equity warrants are used by promoters to raise their stake at a future date. A warrant is a security that entitles the holder to buy stock of the company that issued it at a specified price, which is usually higher than the stock price at the time of issue. Companies issue warrants to enhance the future value of their stock to the people holding it. If Ambani infuses capital into RIL, it could be a boost of sorts for investors in the company as well as overall investors. In recent months, many promoters have either postponed or cancelled their right to convert preferential warrants, attributing it to poor market conditions as well as costs of acquisition. An analyst with a Mumbai-based brokerage, who didn’t want to be identified, said: “The interest costs for promoter funding for buying shares have soared to 18-24%." The Bombay Stock Exchange’s Sensex, a 30-company index that includes RIL, has lost 34% since the beginning of 2008 after posting 45% returns in two previous years. Since the beginning of the year, RIL has lost close to 35%. On Wednesday, RIL shares fell 2.84%, or Rs54.85 a share, to Rs1,873.60. The shares are sharply off their 52-week high of Rs3,252.1 set on 15 January and trading near the 52-week low of Rs1,800 set on 16 September. RIL carries a hefty 14.73% weight in the Sensex and about 11% weight in the broader 50-company Nifty index of the National Stock Exchange. On 27 February 2007, when RIL announced issuance of 120 million preferential warrants, Ambani, its chairman and managing director, had said: “The board’s approval to enhance the equity capital of the company by preferential issue of warrants to promoter demonstrates our commitment to value creation at Reliance." A slew of companies announced preferential warrants issues following RIL’s early 2007 move. Kumaramangalam Birla, who controls the Aditya Birla group, announced in March 2007 a plan that included a preferential warrant issue of 80 million warrants with an option to convert them into equity for Rs1,400 crore. On conversion of warrants, Reliance Industries’ equity capital will increase by 8.6%, from Rs1,393 crore to Rs1,513 crore. The warrant conversion option comes at a time when some analysts are apprehensive whether RIL can sustain its healthy gross refining margins. “There are concerns of downside risk to financial year 2009 estimates earnings of Reliance Industries. Singapore refining margins have slumped and there is worry that D6 oil and gas output may be lower than expected," Merrill Lynch analysts Vidyadhar Ginde and Sudarshan Narasimhan wrote in a report released on 22 August. But the report also touched upon the upsides. “Upsides are likely due to year till date petrochemical margins and exchange rate being higher than our FY09 assumptions. FY09 gas output being higher than assumed also cannot be ruled out," Ginde and Narasimhan wrote.